MetaArcade’s Tunnels & Trolls Adventures mobile game is out! 3D dice roller is decent, reasonably fast but lets you see the dice wobble around. However, sometimes they get stuck crooked, which shouldn’t happen. Adventure adaptation is fine, from what I can see. Buffalo Castle lets you see a map (of the complete structure, not just what you’ve explored) fairly often, but it’s not always on-screen. There’s no map in Naked Doom, but where would you write it, and how? Dying in an adventure just returns you to start with nothing lost or gained. Actually completing an adventure saves your progress. Only Warriors currently exist. They say they’re adding Wizards (and hopefully Rogues?) 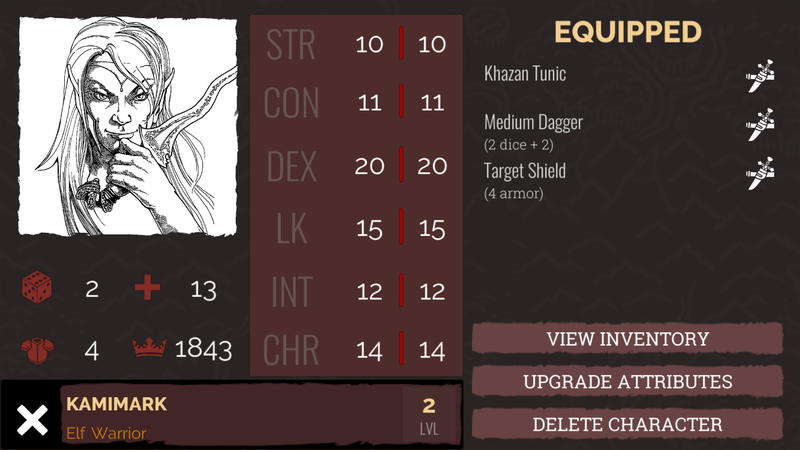 later, but I really much prefer to play a Rogue in T&T. It’s mostly 5th Edition-like, with 6 stats, levels based on AP which give you stat points, rather than AP improving stats which determine your level. 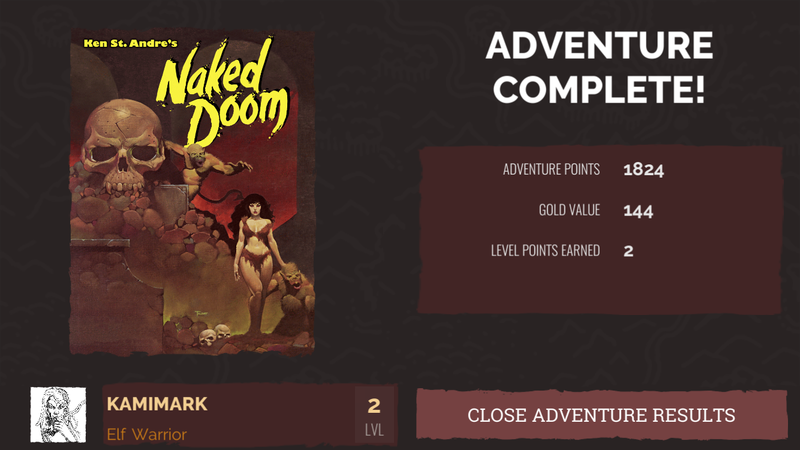 Starting you out with only Naked Doom, no equipment store in the game, is kind of lame. The initial shopping trip is one of my favorite things in T&T. Nope, you get whatever gear you can scavenge from an adventure. Unlocking adventures uses IAP currency, which is… not fine, disappointing but typical. I guess I should be glad they’re not offering revives or bonus gear for IAP currency (yet; don’t get bad ideas, guys). Buffalo Castle, which you can play for free on the web and has usually been the freebie pack-in adventure, costs 40 gems = $4. Golden Dust Red Death, Seven Ayes, and Grimtina’s Guard “mini-solos” cost 10 gems = $1 each. And of course they sell gems in units of 10, 50, or 110 (for $10), not 70 which is what “unlock all” would be. Playing an un-purchased adventure costs 1 “heart”, which you can apparently get more of by watching video ads. You’re going to need quite a few tries for most of these, so figure 5 or 10 videos per completion. The art is a mix of styles from 1970s Liz Danforth and others, to some cheesy Fiery Dragon Press-type work, and not every room or foe is illustrated. There’s little sound other than a repeating music track which got turned off quick. Sorcery! mobile games, which have lovely maps, pretty heavy amounts of classic and new art, and are paid-up-front. All 4 Sorcery! games are $17, but they have working sorcery. Play time’s probably longer but more frustrating in T&T Adv than a single Sorcery! game, but all 4? I think I’ll stick to tabletop T&T Deluxe, and buy more solos. This is cute, but not that cute.